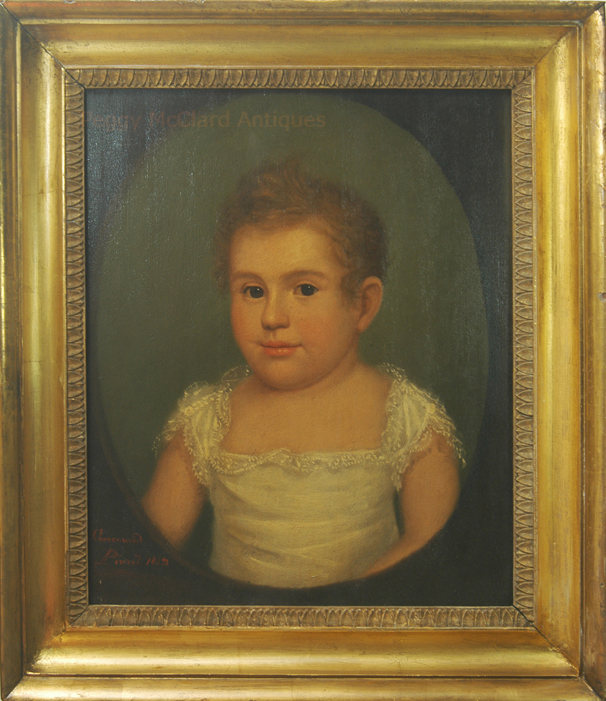 Ethan Allen Greenwood (1779–1856) was a lawyer, portrait painter, and entrepreneurial museum proprietor in Boston, Massachusetts in the early 19th century. He was born in Hubbardston, Mass to Moses and Betsey Dunlap Greenwood on May 27, 1779. His father was a farmer and Ethan worked on the farm until he was nineteen. In 1798, Greenwood entered the Academy at New Salem and then attended Leicester Academy. In 1806 he graduated from Dartmouth College. 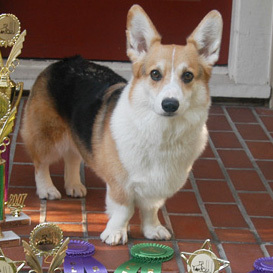 Greenwood studied law with Hon. Solomon Strong and was the first practicing lawyer in Westminister, Mass. 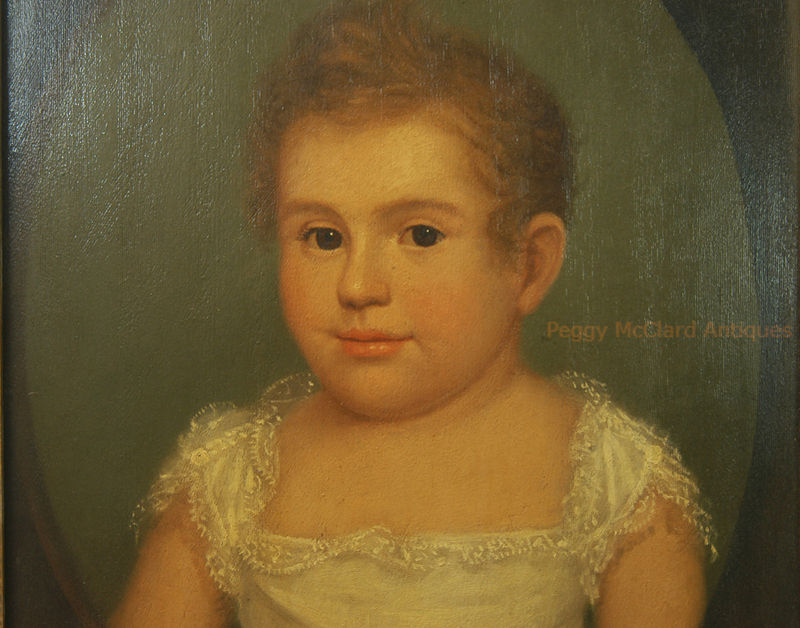 Greenwood first started painting portraits in 1801. In 1806, he studied painting under Edward Savage in New York. In 1812, Greenwood was living in Boston, working at the Linen Spinner Company, of which he was co-owner. He also taught school, all while painting. But in 1813, he turned to portrait painting as a profession, opening a studio at what is now Scollay Square, near the State House in Boston. In 1812, the New York Museum was founded at Boylston Market, Boston by Greenwood’s mentor and teacher, Edward Savage. In 1818, Greenwood opened the New England Museum on Court Street. Greenwood’s New England Museum soon absorbed the New York Museum from his mentor. Greenwood continued to buy the collections of other Boston Museums and by 1825, the New England Museum and Gallery of Fine Arts was housed in eleven large halls and apartments. Greenwood also established museum branches in Portland, Maine, and Providence, Rhode Island. However around 1834-1839 he experienced financial difficulties, and as a result "his assignees conveyed the collections [of the New England Museum] to Moses Kimball." Kimball would then found the Boston Museum and Gallery of Fine Arts, a theatre and exhibit hall, featuring a portion of Greenwood's collection; Kimball sold the other portion of Greenwood's collection to a museum effort in Lowell, Massachusetts, in 1840. 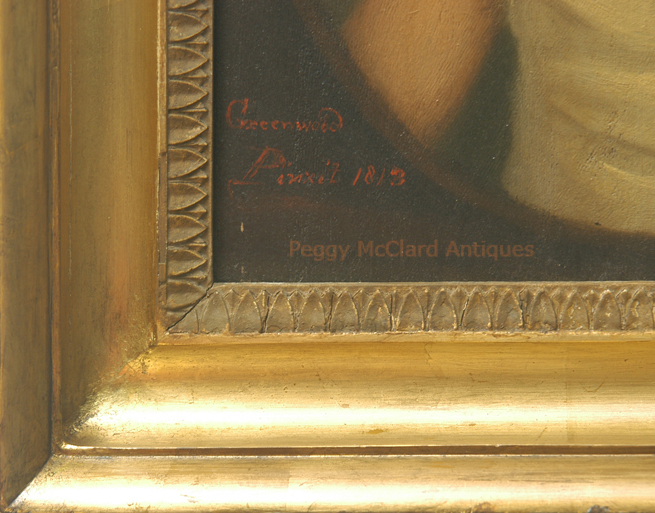 Between 1801 and 1825, Greenwood painted as many as 800 works. Like many artists of the early 19th century, Greenwood utilized the physiognotrace technique (or camera obscura) to obtain what he considered a perfect likeness. He kept a studio in Boston, circa 1813; and associated with other artists, including Gilbert Stuart. He joined the Ancient and Honorable Artillery Company in 1814. He married Caroline Carter Warren in 1829. After the death of his parents, he moved back to the farm in Hubbardston and built a large home. He became active in public and business affairs of Hubbardston. "June 1st, 1824. A Mermaid arrived here last week & I agreed to exhibit it. Busy setting up Shark. -- 2nd. Purchased some Indian Curiosities. -- 3rd. Bought four figures of an Italian $4.00. -- 5th. Bought four Busts of Voltaire, filling up jars of reptiles.... -- 7th. Artillery Election good run of business & in the eve a 'Glorious House' $342.75. Best day since the Museum began. -- 10th. Bought a young Shark." 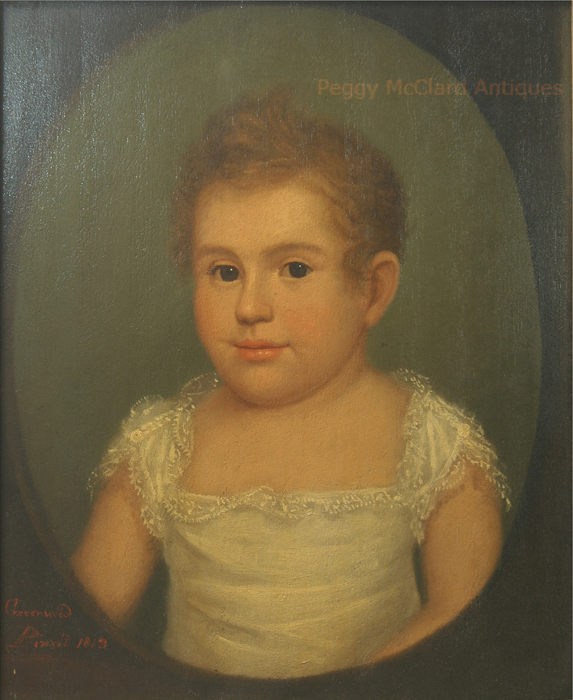 Greenwood’s portraits are included in numerous museum collections, including the Worcester Art Museum and the Brooklyn Museum. 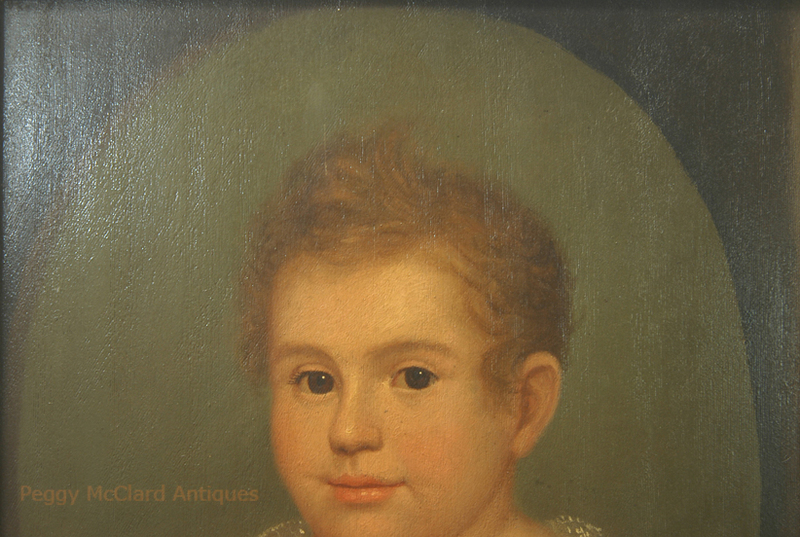 This portrait of a young child is a wonderful example of Greenwood’s work. 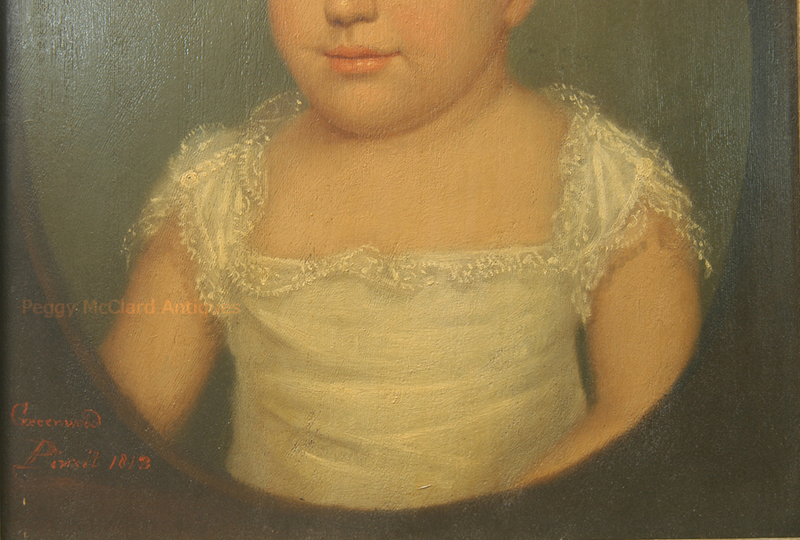 The toddler’s large brown eyes gaze directly a the viewer. Facial features are well-defined yet soft in appearance. The toddler’s muslin and lace dress is beautifully depicted with great attention to the details. The portrait on panel is painted into an oval portal. 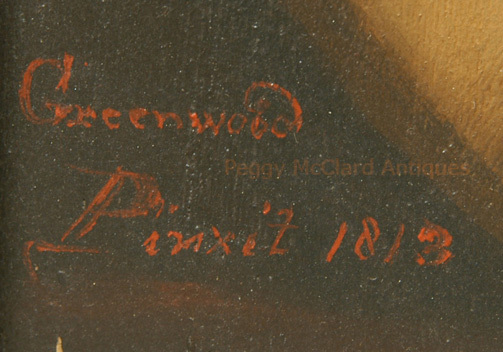 The artist signed the lower left corner, outside the portal, “Greenwood / Pinxit 1813”. 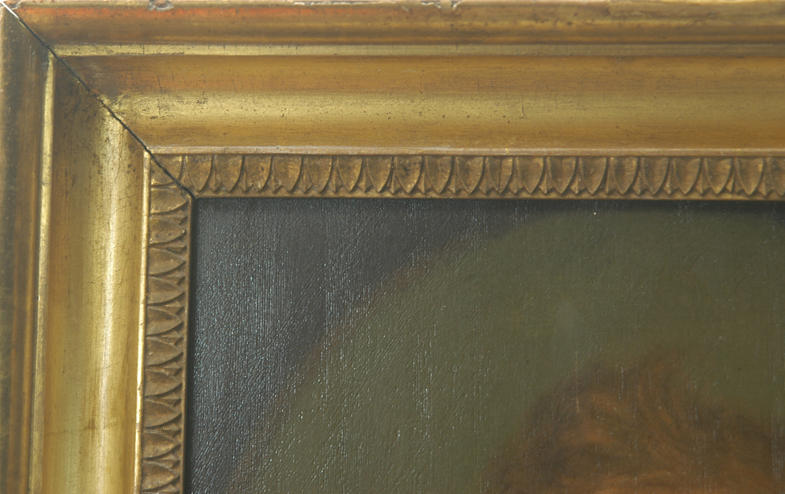 The gilt frame is original with restoration to the gesso and gilt along the bottom stick of the frame and partially up both sides. Panel size 13 3/4" x 16 5/8". Framed size 21 3/16" x 18 1/2". Bumgardner, Georgia Brady, "The Early Career of Ethan Allen Greenwood", Itinerancy in New England and New York: Annual Proceedings of the Dublin Seminar for New England Folklife, Peter Benes, ed. Boston. 1984. "Greenwood, Ethan Allen, Papers, 1801 - 1839", American Antiquarian Society Manuscript Collections. Worcester, Massachusetts.